OSWEGO, NY – The Oswego Lions Club recently showed its commitment to supporting the local community by contributing $1,000 to help the United Way of Greater Oswego County fight hunger. 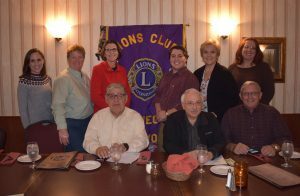 United Way Resource Development Director Lexie Wallace, pictured at left, recently attended a Lions Club meeting to thank the group for its continued support. The donation went toward the United Way’s annual Stone Soup Luncheon held on Oct. 30 at St. Joseph’s Parish Center. Each year, the event brings together area businesses and community members to collect monetary and nonperishable food donations which are used to fill the shelves of local pantries as the holiday season quickly approaches. Wallace said the sponsorship from the Lions Club, combined with donations collected from event attendees, resulted in hundreds of dollars and boxes of nonperishable food items going to three local pantries: the Human Concerns Center, Catholic Charities of Oswego County, and Salvation Army of Oswego County. Along with the contribution from the Lions Club, Wallace said the day would not have been possible without help from generous local businesses and teams of dedicated volunteers. Ending hunger in Oswego County is one of the United Way’s three main target areas. To learn more about the organization and find updates about future events, visit www.oswegounitedway.org.